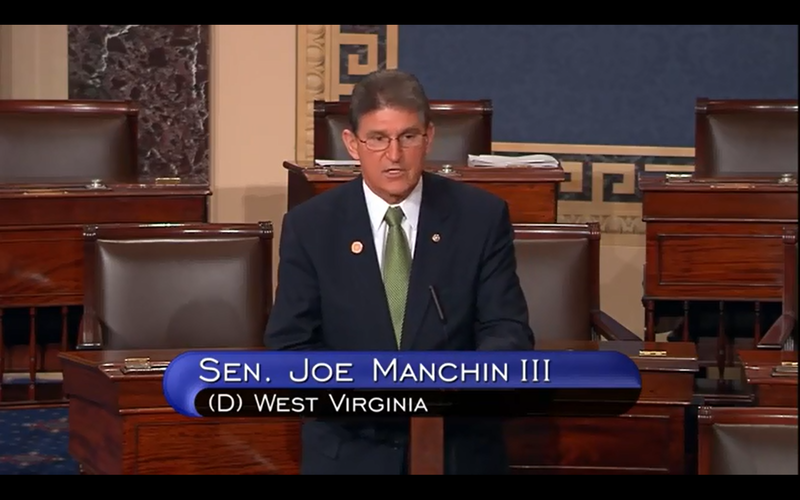 July 19, 2013 by Ken Ward Jr.
West Virginia Sen. Joe Manchin keeps doing his best to promote himself as some sort of reasonable, bipartisan deal-broker, using his “common sense” approach to various issues. This maneuvering led him yesterday to be the only Democratic Senator to oppose the confirmation of the woman his party’s president wants to run the U.S. Environmental Protection Agency during the second term of the Obama administration. In fact, it’s not hard to imagine that she could have been nominated to be EPA Administrator by Mitt Romney if he had won the 2012 Presidential election. After all, she advised him on climate change when he was Governor of Massachusetts. … My vote against her goes much deeper than her nomination, her views on energy and the environment or even her job performance the last four years as head of air policy at the EPA. No, my vote against Gina McCarthy is really a vote against the Administration’s lack of any serious attempt to develop an energy strategy for America’s future. We need to develop every source of American-made energy. It’s only common sense to use what you’ve got. The President often speaks about an “all-of-the-above” energy policy. But his new global climate proposal amounts to a true declaration of war on one of the above – coal. My fight is with the EPA and the President who nominated her to head the regulatory agency. That fight will not end with the Senate’s vote on Ms. McCarthy’s nomination. That fight will continue until the EPA stops its regulatory rampage and until the President comes up with feasible policies that achieve real energy independence. We’ve talked about this before on Coal Tattoo. The political quest for energy independence is really a “dry hole” and an “empty campaign promise.” What Sen. Manchin really wants to be asking is not how President Obama intends to make our nation “energy independent,” but how the president plans to lead the U.S. and the world toward fixing the climate crisis. In particular, Sen. Manchin might do his constituents more good if he focused on how West Virginians — especially his friends in the coal industry — can do their part in that fight. A new report from the U.S. Center for Naval Analyses and the London-based Royal United Services Institute, two of the NATO alliance’s front-line strategy centers, recommends putting more effort into fighting global warming than securing reliable supplies of fossil fuels. The authors call the habitual American fixation on winning energy independence through expanded North American production of oil and natural gas “misguided.” They say the “only sustainable solution” to the problem of energy insecurity is not through more drilling, but through energy efficiency and renewable fuels, like biofuels to replace oil. … And in blunt language, they criticize American policymakers and legislators for refusing to accept the “robust” scientific evidence that emissions of carbon dioxide are already causing harmful global warming, and for refusing to take actions that, if taken swiftly, could ward off its worst effects. “Political leaders, including many in the United States, refuse to accept short-term costs to address long-term dangers even though the future costs of responding to disasters after they occur will be far greater,” said their report, published this month. Politics as usual. Nothing new here. Manchin is a politician and will say anything to get votes or other benefit. On the one hand he says he represents the people of WV, and I’m sure he does represent a sizable segment of the population. But, it’s a US Senators job to make decisions that are right for the good of the people of this country… long term. The Senator knows in his heart what needs to be done for the Earth, but his short term view will not let him publicly espouse that view. I would repeat what has been said so often, the need for coal will not go away overnight. Appalachian coal interests will be in business for many years to come, but our leadership must start leading us toward a future without coal (and other fossil fuels). This should begin with blocking in anyway possible the most destructive of all coal extraction methods, surface mining and mountaintop removal mining. At this moment in time renewable clean non-fossil energy cannot provide the electrons we think we need, but our leaders should put in place plans for the day that fossils are no longer needed (or legal.) This would include ending all subsidies for fossils, incentives for clean energy research and development, discouraging all exports of fossil energy including gas, and most importantly ending mountaintop removal mining and ending contamination of ground water with fracking fluids and tar sand wastes. Senator Manchin appears to be confused about the role of the EPA. It is the Environmental Protection Agency, not the Energy Protection Agency. If the energy producers and mining and oil and gas industries would use a “common sense” approach to their activities and processes that did not compromise air and water quality, the EPA would not need stricter regulations. One might “turn the lights off, turn the air conditioning off, turn it all off and see how you like it …”, but I would encourage the senator to turn off the air and water for a period of time and see how he likes the result. Senator Manchin represents West Virginia not the “World”. He should do what is best for West Virginia. The failure of the coal industry will have a terrible toll on our State. Okay.. right now natural gas prices are BELOW the industry’s own estimates of minimum sustainable market price (ie. the cost of production and distribution with a minimum of profit required to continue production). In other words, the supply of natural gas in the market MUST be reduced and the price increased for the market to be sustainable. This is basic market economics. Experts say the MSMP of natural gas is somewhere around $5 per million btu. Right now, natural gas is trading at about $3.25 per million btu — in other words about 35 percent below the MSMP. And natural gas prices have historically swung wildly — from a recent low of $1.90 per million btu to as much as $14.50 per million btu. Meanwhile, coal has always traded in the $2.50 to $4.00 per million btu range — a fairly stable price structure. Now, when you look at two basic types of power plants – a natural gas plant and a pulverized coal plant – the production price of a megawatt of electricity is composed of about 80 percent fuel cost versus 20 percent plant operations costs. A pulverized coal plant can produce that same megawatt of electricity at a total cost comprised of about 75 25 percent fuel cost versus 75 percent operations costs. Now fuel costs are what is known as “variable costs” while plant operations costs are “fixed costs.” Anyone with basic economic knowledge knows that it is in the business’s best interest to reduce variable costs. It is also in the consumers’ best interests. When most of your cost for a product is tied to variable costs then the end user (the customer) is subjected to potentially wide price swings in the price of the good (electricity). When that good is a basic essential of modern life, that poses major problems for the economy. This is especially true when the one fuel is currently priced far below its minimum sustainable market price. By switching to this fuel on the basic of what amounts to a false economy — you are essentially locking in a factor of inflation for the consumer. In this case you are looking at a potential increase of at least 35 percent and probably more likely 50 percent when the demand/price curve reaches equilibrium. Is this what you want for the good folks of West Virginia? A 35-50 percent increase in electricity rates? I don’t. Well, we have already seen that kind of electric rate increase in West Virginia, caused by a jump in coal prices in 2008, not natural gas. APCo’s WV customers will be paying off the 2008 coal price jump for at least the next ten years, on top of the new rate increases that APCo has planned and any new fuel price increases. Mr. Headley is right that variable costs, primarily fuel costs with fossil fuel plants, can cause dramatic rate increases. But the same can be said for either coal or gas. The one big difference between coal and gas right now is that coal is easily exportable, so domestic prices for coal are largely determined by world markets, driven largely by coal-hungry China and India. Significant natural gas exports from the US are still probably decades away, so increases in North American gas supply directly translate into lower domestic prices. Of course, wind and solar power generation have no fuel costs, although their initial capital costs are higher. But once generation facilities are built, there is no future fuel risk at all. I agree that natural gas prices are bound to rise, as they are already. But there are a lot of risks associated with coal-fired electrical generation beyond price. I don’t claim to know anything about operating an electrical generation plant, but I can see the behavior of the people who do. Electric companies that actually produce electricity continue to build new natural gas fueled plants and continue to convert coal burning units to gas. Bill, it can happen with coal and gas, but look at the historic price trends and coal is MUCH less variable than gas. And you might take a second look at the building of plants — very few new plants are being built for either coal OR gas in the United States. What is happening is that utilities are turning on natural gas fired peaker plants and there is some conversion of coal plants to gas, but around the world it is coal plants that are being built. Even that 2008 increase could potentially pale in comparison to the price instability that will likely be seen with natural gas. What we need is a market-driven energy mix, not a policy-mandated shift. Oh, and Ken, I know all about the EIA and PJM projections showing the sharp drop in price out at (I think) the 2017 period. I asked about that and was told that those projections are based on the CURRENT PRICE STRUCTURE, which is a false and unsustainable price structure for gas. I don’t claim to know more than these researchers or the generation industry. I’m just reporting what they are projecting and what they are doing. Mr. Headley, I would like to see some reference for your claims about new coal and gas plants, as well as coal to gas conversions. The fact is that flat demand is restricting the need for any new construction for any kind of new generation. Bill, you just answered your own question. How many NEW gas fired plants have you seen announced or completed? Look through the industry literature. Yes, flat demand is restricting the need for new generation to some degree, but you have hundreds and thousands of MWs going off line in the next few years that is coal-based. If the power generation industry was that excited about natural gas as THE alternative, and since we are in or near the trough of a recession, don’t you think we would be seeing many new gas plants announced to take care of the anticipated demand when the economy does improve? Look at that last one… really look at it. Very little construction actually happening… some talked about but very little actual movement. The price of natural gas used for power generation increased by more than 31% during the first quarter of 2013 while the delivered price of coal actually decreased by over 2% during the same period in 2012. The result was a decline in electric output by gas of over 8% and an increase by coal of nearly 13%. That’s according to a GenerationHub Fossil Fuel Tracker analysis of U.S. Energy Information Administration (EIA) data. In the first quarter, the delivered price of natural gas was $4.36/mmBtu while the delivered price for coal, which includes transportation fees, was $2.35. During the first three months of 2012, by comparison, the delivered price of natural gas was $3.32 while the delivered price of coal was $2.41. The GenerationHub analysis also indicates that the price swings have been more dramatic for independent power producer plants compared to traditional electric utility plants. Non-utility merchant plants have seen natural gas prices increase more than 45% in 1Q13 compared the same period in 2012. Electric utility plants saw their year-over-year price of natural gas increase 18.6% in 1Q13 compared to the same period a year earlier. The price of coal for deliveries to regulated electric utilities decreased 1.7% during the same time period. The U.S. electric utility fuel mix for the first three months of 2013 was 39.7% coal; 25.8% natural gas; 19.9% nuclear power; 7.7% non-hydro renewables; and 6.6% hydro. Power generation from oil only accounted for three-tenths of 1% of the nation’s generating mix during the first quarter. Given the cost differential between coal and natural gas during the first quarter of this year it’s not surprising that coal generation is up 12.9% over the same period in 2012. Power driven by natural gas was down 8% in the first quarter. Overall, electric generation at US plants topped out at 983,615 million MWh in 1Q13 – up 2.4% from the same period last year. Coal burn at electric generating plants topped 212.8 million tons, up 11.3% from 191.1 million during the same period in 2012. A symbolic “against” vote is common in Congress when the vote outcome will certainly be “for”; he praised her for emphasis. The question as to whether a U.S. Senator should first vote for what he or she thinks is best for the nation and second for what he or she thinks is best for the state he or she represents, or, visa versa, has been argued ad naseum. Senator Byrd obviously put his state first but not too long before his death he took the WV coal industry to task for not participating in the discussion on how and when coal production will become a mere shadow of its former self. Senator Rockefeller did the same. Exactly what did they believe the coal industry should do about global warming? Did they forget the fact WV coal only produces about 1.5% of the world CO2 emissions? Why didn’t they suggest ways the federal government could ease the pain of laid off coal miners and their families like tax credits for companies paying severance taxes to be used for miners’ severance pay, relocation expenses, retraining,etc.? To suggest west Virginians should participate in the fight against global warming seems to ignore only 16.2% of the world total CO2 is produced in the U.S. from all sources, China emits 28.7% and increasing yearly, and the other countries can by the “U.S. taking the lead” significantly cut their CO2 emissions given their dire financial condition—except China, of course,which must emit more CO2 every year in order to grow its economy and continue raising its standard of living . Making the WV coal industry the whipping boy of WV environmentists and certain WV newpapers is detrimental to attracting new industries to come to WV. The link Mr. Headley provided was to an article about gas/coal prices. That is not what I asked for. I asked for a link to information about new plant construction and conversions. Still haven’t seen that. Fossil fuel prices are volatile. That’s a fact. As relative prices change, capacity factors for different fuels will change. Big deal. The information in the link that really mattered was that non-hydro renewables are now 7.6% of the electric capacity equation. Again, there are no fuel costs (except for biomass, which is probably included in this figure) for this category of generators. There is another post that is apparently “awaiting moderation” by Ken that included links to several sites related to power plant construction. There are several links “awaiting moderation” for some reason. Posted them.. ask Ken why they aren’t there. So, here is my last word on this site period. Mr. Ward, if you can’t provide a fair and open forum, then don’t pretend it is. A quick note regarding posts in this thread — There was quite a bit of discussion going on over the weekend, apparently much of it on Saturday. Personally, I took the day off for some family obligations, and was not checking the blog comments section. As best I could tell, two of Mr. Headley’s posts were “awaiting moderation” during that discussion. The reason? They included three links in a row, with no other text … the “spam” filter on our blog system often captures posts that include multiple links like this, and holds them awaiting approval from the blog moderator (me in this instance). And as I said, I didn’t check the comments section over the weekend … from probably about 3 p.m. Friday until 9 a.m. Monday … I’ve now done that, and released those two posts for publication. (As an aside, I believe I addressed this same issue — posts being hung up in moderation while I’m temporarily not sitting at my computer awaiting the next comment — in this very recent post, http://blogs.wvgazette.com/coaltattoo/2013/07/15/should-w-va-fight-old-battles-or-look-to-the-future/ in which I explained why a particular comment had not been moderated when it was posted while I was off duty). One solution for this problem is to post links or citations to support what you say *the first time* you make the remarks. It’s been suggested by a wide variety of people that this is too onerous to expect of readers … well, that’s too bad. Those are the rules for this blog, and they aren’t going to change. Let’s try to 1) Not try to assume we know what someone else is going to say before they’ve had a chance to speak; and 2) not address comments to other readers in a disrespectful manner — be nice to each other; and 3) lay off the ALL CAPS … there’s no need to yell, folks. If you want to emphasize something, do it like *this*. Perhaps it’s too much to ask that people come to the comments section in an effort to learn from each other, rather than just spout the line they are paid to spout … but I’ll turn off the comments here altogether rather than let it deteriorate into the sort of nonsense that generally shows up in most online discussion forums. Is anyone else amazed at the idea that West Virginia, accounting for something like .04% of the earth’s land surface, would have 1.5% of the world’s CO2 emissions? No, Soyedina. If WV didn’t produce coal, Montana, Wyoming, Illinois,Kentucky, Pennsylvania, Virginia, Indiana, and Alabama would make up the difference because the demand for coal would be the same. WV does not “have 1.5%” the world emissions. Much of the coal mined in WV is not burned in WV but the WV land area is irrelevant anyway. Agreed, I would be interested in seeing the source for this number. And if realist has another figure, I’m sure that would be useful to the discussion. Realist is not amazed that (given the figure is accurate) such a small land area is responsible for a larger CO2 emissions footprint, but I don’t understand what coal demand has to do with that or why the land area is irrelevant? The land area is the point. If we want to talk about how to set standards that don’t economically impair developing countries, and (again) assuming this figure is accurate, then it seems WV is disproportionately hogging the CO2 pollution. Is realist suggesting that CO2 emissions would be fairly distributed if the coal came from larger states where the fraction of total emissions is equivalent to fraction of total land area? How should we allocate CO2 emissions if not on the basis of land area or population size? Which, is true, even though there are a number of unpalatable [to me, anyway] assumptions buried within the premises. The point is not what I prefer, however, but that reasonable arguments can be made against this criterion. Land area at least has the potential to correct for some of the effect the current population size on this metric for assigning caps to CO2 emissions. If we look at some of the top emitters on ken’s link and divide the emissions by the land area provided by Wikipedia for these countries, Germany, Japan and the UK are the worst emitters by several orders of magnitude. This is interesting I believe because these countries have all industrialized and reached demographic transition, thus population sizes are likely to be less volatile than countries which may be in the process of industrialization. Personally, I have no clue on what the best criteria should be for assigning max emissions, but I believe it would be a good idea if we care about limiting climate change whatsoever. Having posted that — which Mr. Morrison included in a previous comment — I’d appreciate it if he posted links or citations to support his figures. There is no shortage of statistics on Google. Actually so many it can be confusing. Most if not all the stats I used came from U.S. Energy Information for the year 2012. WV’s share is really slightly higher than above because WV bituminous coal has more carbon content than western subbituminous coal but my point remains the same: WV’s share of the world CO2 emissions by burning coal is much smaller than most people would think. Moreover, natural gas which is displacing much coal in power plants still produces about half as much CO2 as coal on a BTU basis. So the WV economy would be wrecked and thousands more coal miners laid off if more switching to natural gas occurs, but it would not slow climate change. Unfortunately, Mr. Ward strongly implies it would without citing any proof. 16.7% is the U.S. 2012 share of world CO2 emissions, down 1.2% from 2011. 28.7% is the China 2012 share of world CO2 emissions, up 11.8% from 2011. Please kindly provide the rest of the readers with the links to where on the EIA website you found the data you used.